Everything a true geek needs in ONE! This high tech gadget has enough bells and whistles to make most geeks drool. 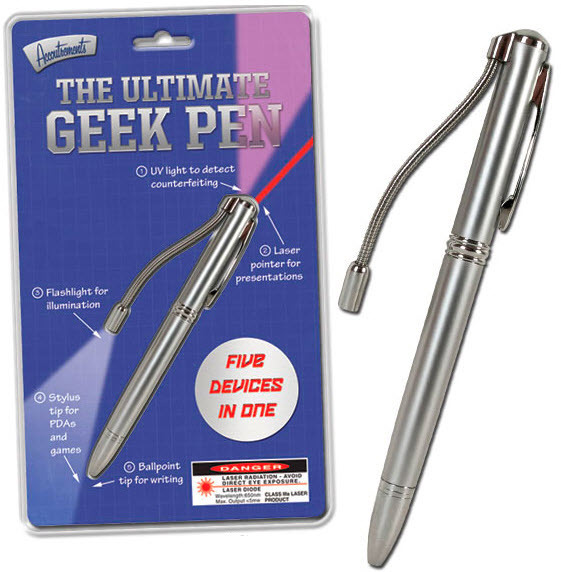 Twist the metal tip one way and you get a ballpoint pen, twist it the other way and you get a stylus tip for use with PDAs and games. Press the top button to turn on the laser pointer, press the bottom button to cycle through the flashlight and UV light. The flashlight even comes on a flexible rod for precision aiming. 5-1/4" (13.3 cm) long. Batteries included. Clamshell blister with illustrated card. Battery is replaceable. Takes AG3 batteries.